Hybrid roses have more than five petals because they are made for ornamental purposes. ﻿ Everybody loves roses they can be quiet fussy to grow but a little care goes a long way to produce beautiful blooms. They come in all colours from whites, yellows, reds and even black. Did you know that real roses only have five petals? This means other roses are hybrids made for ornamental purposes. By following my easy method your roses will look lovely throughout the year. The plants must be watered every two days. Always water after applying granular fertilisers. When feeding roses it’s good to use a granular fertiliser, just before the first blooms are opening, about 30g scattered in a circle around the stems of medium sized rose bushes but always read the requirements on the packaging. Always water after applying granular fertilisers. Watering should take place at least twice a week, or every second day depending on the season but it’s always good to feel if the soil surface is dry or not, it gives a good indication of when to water the plant. Water at the base of the plant and not the leaves. Black spot on roses appear as round lesions, these spots can be small to large lesions. Black spot and aphids love roses. They never seem to go away and the best advice I could give here is that prevention is better than cure. Black spot is a disease and the truth about it is that once it’s there it can’t go away. You need to spray your roses regularly with a systemic fungicide. This means that the fungicide will be taken up by the plant and then protect it from the inside out. When you see black spot all over your roses try and prune the serious parts but if you can’t leave it alone it will eventually go away. 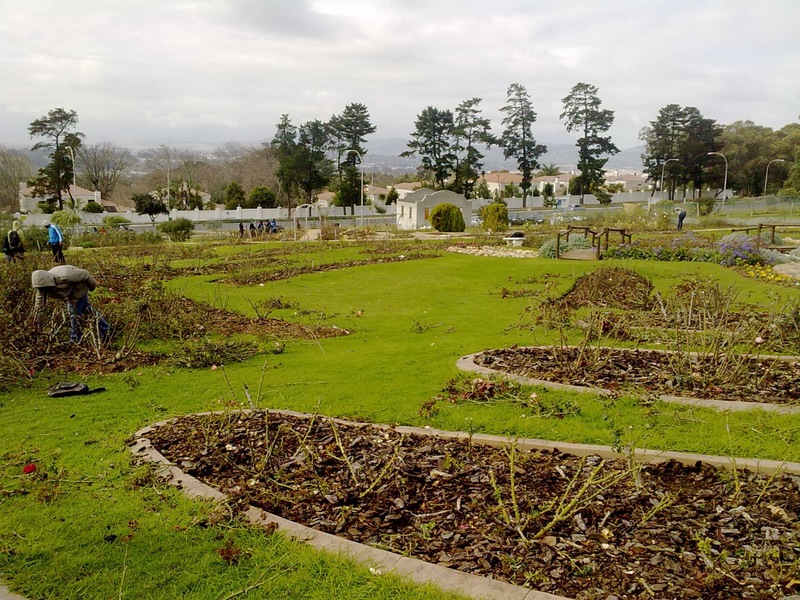 While I was a student our class went to a local rose garden and this is where i learnt most of my rose pruning skills. I couldn't wait to get home that day to prune all our roses as well! Two important techniques I’ve learned during a rose pruning practical at Durbanville Rose Garden are to prune your roses in such a way that you leave the bush in an open wine glass. Meaning cut away branches that are growing inwards. Try to leave the middle open so that air circulation can take place, it also decreases the risk of disease on the leaves. The second technique is when pruning make sure you leave all the branches at more or less the same length, this will ensure that when they grow you have equal amounts of growth from each stem, if one stem is higher than the others the plant will generate all its energy to just that one stem giving you large roses from that stem only and smaller roses from the others. When cutting roses for the house, don’t cut too many blooms at once as it drastically reduces the amount of leaves resulting in root disturbance this will set the rose bush back. Roses bloom best when they are a third to half open when picked. And don’t forget to watch out for those thorns! I hope these few tips help you with your roses at home.